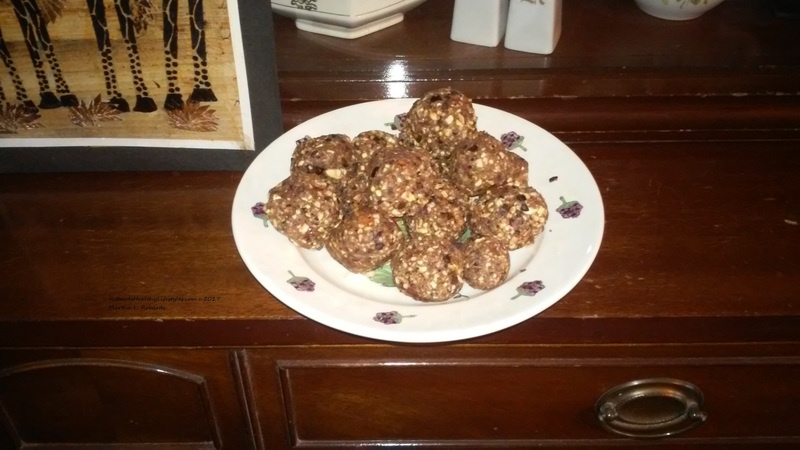 These chocolate protein balls are a variation of a recipe from Kimmie Lyons on LinkedIn. These are chock full of nutritious ingredients. 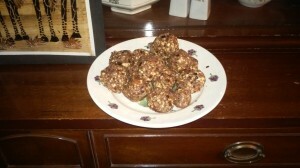 Mix all ingredients together and form into balls. 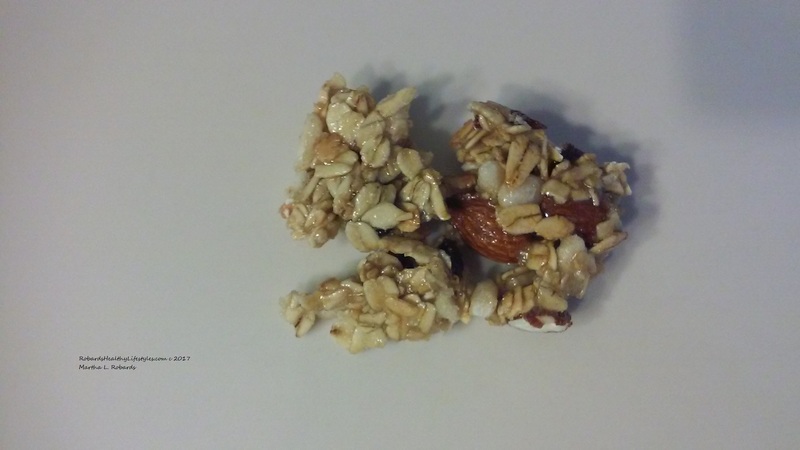 Delicious and a great, healthy snack! c 11/2017 For more recipes, go here. With an increase in prevalence of Breast cancer, awareness of breast cancer – its causes, prevention, and treatment options has also increased. October month is dedicated as Breast cancer awareness month when various foundations, groups, companies, and people like to come together to raise money and promote awareness of breast cancer. The reason for all this attention to the Breast cancer is because it is the second most leading cause of death in women in United States. This means that every 1 in 8 women will be diagnosed with breast cancer in their lifetime. According to the World Health Organization, breast cancer is the most common cancer among women worldwide, claiming thousands of women’s lives each year and affecting most countries. The good news is that Death rates from breast cancer have been declining since 1990, due to better screening and early detection, increased awareness, and continually improving treatment options. There has also been major shift in the mindset of society with success not being measured as “cancer free” but also returning back to “pain free active lifestyle”. With this emerging mind set, Physical therapists serve as valuable members of a multidisciplinary breast cancer team. Physical Therapy plays a major role in rehabilitation both before and after breast cancer treatment. The Physical therapist would perform a “pre-surgical screening evaluation” before the breast cancer treatment. This is an important procedure as the physical therapist will gather baseline information regarding physical status which will assist the therapist in designing an individualized treatment program after breast cancer surgery as well as treatment through chemotherapy, radiation, initial and reconstructive therapies, and years afterwards if difficulties persist. Women and men who have surgical procedures to remove cancerous tumors often experience pain and a decreased range-of-motion after surgery. Swelling, or lymphedema, may also be a risk. Working with a rehabilitation specialist before and after procedure can significantly impact functionality and pain levels as the patient recovers. Post-Surgery Physical therapist helps the patient restore their mobility, manage their pain, limit and reduce lymphedema, improve function and help the patient go back to life. Patients undergoing radiation therapy often experience tightening of skin, fascia and muscles. Physical therapy can help that through various stretching exercises, manual therapy and patient education to manage and improve flexibility. Exercise significantly improves attention, and memory in breast cancer patients. Considering that many breast cancer patients suffer from ‘chemo brain’, a feeling of ‘fogginess’ or difficulty with thinking and memory that can occur after breast cancer treatment, Physical Therapy offers a nice recovery option. Physical Therapy helps patients manage delayed complications as well. Complications like Lymphedema can present within few years or even 30 years post breast cancer treatment. Although there is no cure for Lymphedema, Physical Therapists can help normalize the size of the arm and help reduce the risk of infection. Physical therapist can also prescribe compression garments to maintain reduced arm girth. Fatigue is also another major complaint reported by 90 percent of the patient’s even years after breast cancer treatment. Physical therapists can help the patient improve activity threshold with gradual exercise increment sessions. In core, Physical therapy has a lot of offer for patients with breast cancer. It is important to remember that the goal of the multidisciplinary approach is to make Breast Cancer patients “live” and not just survive!!! About the Author: Charu Fnu is a physical therapist with Spooner Physical Therapy. She is passionate about treating breast cancer warriors. She can be contacted at c.fnu@spoonerpt.com or 602-243-1476 if you have any questions in regards to breast cancer rehab. With snack bar sales on the rise, and more and more choices out there, savvy consumers are looking for even healthier varieties of snack bars. They want a calorie conscience healthy snack. Many people who exercise eat a power or energy bar on the way to the gym. Ironically, sugary foods and bars raise insulin — which SLOWS the body’s ability to burn fat by as much as 55%. Choose snack, sport and nutrition bars with less sugar, more fiber, CLA (conjugated linoleic acid), whole grains, multi-source protein blends and omega-3. Your body will be happy you did. You can also make your own bars, if so inclined. Martha is owner of RobardsHealthyLifestyles.com, a health and wellness website that promotes healthy lifestyles, ideas and products for physical, mental and emotional, financial and natural/spiritual wellness. Martha’s work consists of opening shopping accounts for an on-line wellness company (think Costco meets Amazon), presenting, speaking, mentoring and coaching and people building. You can reach Martha at 505-750-7847, by email at marthapmintl@gmail.com, on Facebook, here on LinkedIn, Twitter, or through her websites at RobardsHealthyLifestyles.com, here, here, or ProfessionalMentorsInternational.com. For those in the Phoenix area, the next essential oils workshop will be on November 21. 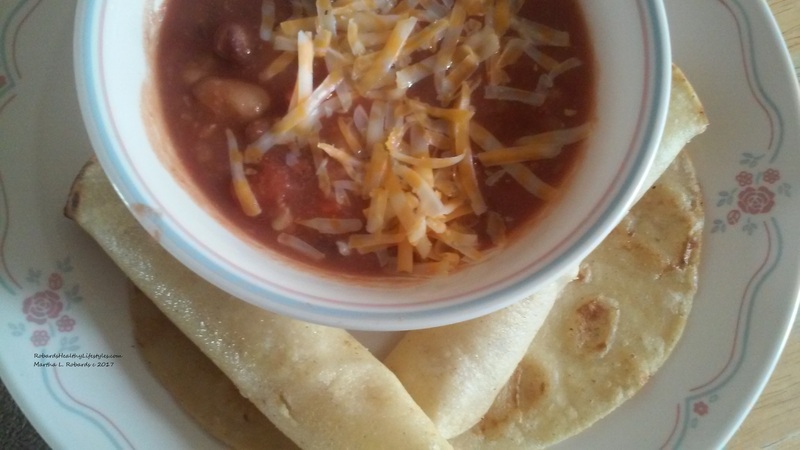 Make some mixed bean soup, with a package of mixed beans, including lima, black, pinto, and some lentils. Add brown rice and boil in water until the beans a tender. I soaked them until they were just starting to sprout. Add a can of diced tomatoes, and a small can of tomato paste, chop up a carrot, cook for 10 more minutes. Add two corn tortillas. Yummy. Many, if not most of us, are aware that vitamin D is necessary for proper absorption of calcium. Recent studies, however, indicate that our needs for vitamin D may go far beyond what traditional thinking has allowed. We derive Vitamin D from the foods we eat and from the sun. Unless we don’t. There are several large-scale trials that are currently in progress. They could provide evidence that vitamin D deficiencies are more prevalent than ever predicted. 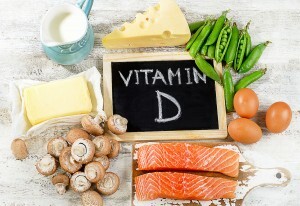 There is also evidence that Vitamin D deficiencies can cause or magnify a broad and ugly panorama of diseases that were previously unsuspected. It suggests that supplementation with Vitamin D can reduce the risk of heart disease, cancer and other chronic diseases that are associated with inflammation. Surprisingly, in addition to those infirmities listed above, vitamin D deficiencies can be linked to diabetes, lupus, preterm birth, IBD hair loss and even depression. This article from “HEALTH” describes a wide horizon of risk. It is astounding the number of potential effects that a deficiency in Vitamin D may cause. Reducing exposure to the sun to reduce skin cancer risks and the modern diet make it almost impossible to assure enough Vitamin D is being absorbed to provide physical, mental and brain health, making the idea of supplementation advisable. The quality of those supplements makes a huge difference, so before you choose, make sure you do your homework. Absorption is a key consideration. Use superior products. Click here to see where this article came from.